The Bitcoin price breached the $700 mark today (Monday), its highest level since February 2014. The Bitcoin price is now up more than 51% in the last month and is poised for even more gains ahead. In fact, we see the potential for much higher gains from the Bitcoin price in 2016. Before we get into our Bitcoin price forecast, here's what is driving the cryptocurrency today. A rule written in the digital currency's code will soon tighten the supply of Bitcoin, and that's why prices are climbing. You see, there is a fixed supply of 21 million bitcoins that will ever be released. Bitcoin was created in 2008 and came to life in 2009 by a process dubbed "mining." The process involves people using computers to solve complex mathematical puzzles in order for a Bitcoin transaction to complete. When a problem is solved, the miner receives bitcoins. Since Bitcoin's debut, the math problems have become more difficult to solve. And the amount of bitcoins miners receive is set to be reduced sometime next month. The reward for mining in 2009 was 50 bitcoins per block. A block is a group of transactions. In 2012, the reward was trimmed to 25. Now, that will be cut in half again. The result will be less supply at a time when demand is surging. Plus, we're fast approaching the mark when 75% of all Bitcoin have been issued. Right now, investors are piling into Bitcoin as a safe-haven investment as global economic concerns mount. In an environment dominated by ever expanding assets and the liberal printing of money, having a currency like Bitcoin that is finite and limited in issuance is attractive to investors who want to hold assets that have sustained purchasing power. That's the trend we've continued to see over the last several years. Investors seeking a safe-haven, money alternative asset have flocked to Bitcoin. Interest in Bitcoin soared last year when Greece was teetering on default. A default by the Mediterranean country would have been the biggest default by a county ever. This year, China has been a key driver of Bitcoin demand. Huobi and OKCoin, two Chinese exchanges, together account for roughly 92% of global trading in Bitcoin. In a hunt for high returns and worries about the decreasing value of the yuan, Chinese investors have been piling into Bitcoin. The yuan is trading just shy of the five-year low it touched in January. Meanwhile, the Shanghai Composite Index is this year's worst performer among 93 global stock measures, according to Bloomberg. Goldman Sachs Group Inc. cautioned earlier this month that yuan weakness may trigger capital outflows and increase bets on a one-off devaluation. Chinese buyers and the upcoming halving are boosting the Bitcoin price. But gains are expected to be sustainable. Still, the Bitcoin price is notoriously volatile. About a year ago, it was trading around $230. In November 2013, it hit an all-time high of $1,242. That was nearly on par with gold's price (at the time) of $1,254 an ounce. The cryptocurrency continues to gain more legitimacy with policymakers. Last year, in a move that underscored its validity, the U.S. Commodity Futures Trading Commission classified Bitcoin as a commodity. Money Morning Associate Editor David Zeiler has been covering Bitcoin for years and is a former Bitcoin miner and recognized expert. He explained to readers last month why the Bitcoin price could head all the way to $1,000. He cited Vinny Lingham, a familiar name in the Bitcoin universe, who believes governments will start to buy Bitcoin as a strategic investment. After all, Bitcoin is essentially digital gold. "Imagine if China started buying up large amounts of Bitcoin – would the rest of the world governments stand idly by and watch? I don't think so – so my prediction here is that by 2017, governments will become the largest buyers of Bitcoin, pushing the price up to new highs," Lingham said. Lingham is so bullish, he not only sees the Bitcoin price hitting $1,000 this year, he says it could climb all the way to $3,000 in 2017. A pair of Wall Street firms are also extremely bullish on the future of Bitcoin prices. Needham & Co. forecasts the Bitcoin reaching $1,896 by 2020. 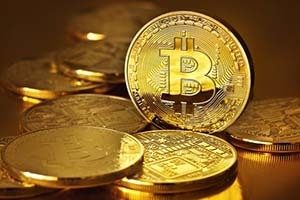 Wedbush Securities predicts Bitcoin prices hitting $17,473 by 2025.